Fuji’s hard work at fleshing out their X series lineup continues at a frantic pace. Today I review the brand new XF 90mm f/2 R LM WR, a lens that has the field of view of the classic 135mm long-portrait lens that has been a staple of many systems over the years. 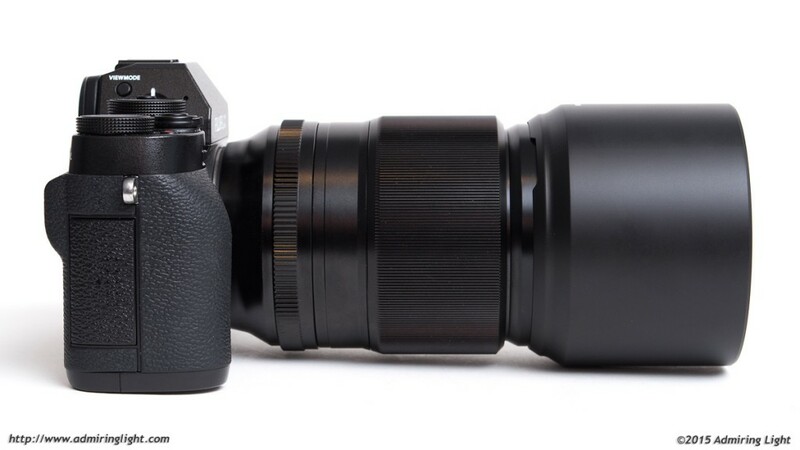 The 90mm f/2 completes Fuji’s standard prime kit, and has been highly anticipated. Early reports point to this lens being simply stunning, so I was eager to get my hands on it. Let’s dive in. If you already own a few Fuji X-series prime lenses, then you have a good idea of the construction of the 90mm f/2. The 90mm f/2 has an all-metal exterior construction with a broad focus ring and a dedicated aperture ring. The lens is solidly constructed with no creaks or wobbles and feels like a very high-end piece of kit. The only thing that gives pause is the floating focus element, which is held in place by electromagnets. As such, when there is no power to the lens, the focus element is free to move in the lens body. If you tilt the lens when it’s detached from the camera, you can hear an audible thunk as the element moves inside the lens body. The focus ring on the XF 90mm is very broad and has excellent damping. Like all Fuji X lenses, focus is by wire, but the feel of the ring is excellent and manual focus is a breeze with this lens. The aperture ring on the XF 90 is similarly excellent. In what feels like a great Fuji Aperture Ring Lottery, the 90mm hits the jackpot, with a beautifully firm and clicky ring that is difficult to accidentally knock out of place. I’m unsure why there is such variance in the stiffness of Fuji aperture rings, but it would be great if they made all of them like the one on the 90mm. The 90mm f/2 is the second Fuji prime to come with the WR designation for weather resistance. The typical gasketing found on all Fuji’s WR lenses is found here, with a lens mount gasket and what I assume are tighter tolerances around the edges. I didn’t get a chance to shoot in inclement weather during my time with the lens, but with my experience with other WR lenses, I’d feel comfortable shooting for short periods during light rain, but would make sure to add a rain cover if shooting in a downpour or for an extended time in wet locations. The 90mm f/2 comes with a deep lens hood that reverses close to the lens body, adding minimal width in the bag. I do have to say that the 90mm isn’t a small lens. It’s a bit shorter and a bit lighter than the XF 55-200mm, and as such it’ll take up some space in the bag. I did feel it handled fairly well in the field however, and felt better on the camera than it appears when handling just the lens by itself. This is definitely a lens that you’ll want to use on a camera that has a decent grip, however. Handling on the X-T1 or X-E2 with the add-on grip feels nice and at home, while a bare X-E2 or the smaller X-M and X-A bodies will feel a bit lopsided. I have to say, though, I’m very glad that the exterior design was changed from what I first saw at Photokina last September. The mockup presented there was a bit shorter than this final design, but significantly fatter, which would have caused much larger issues in fitting into camera bags and handling on cameras with narrower grips. The XF 90mm f/2 is the first Fuji X prime lens to receive Fuji’s fast and silent linear motor system, and it performs very well indeed. Focus locks quickly and accurately in good light, and only slows down a bit in lower light. I experienced very minimal hunting of focus during my shooting with the lens, and as you’d expect, the operation is essentially noiseless. One great thing about the 90mm is its close-focus abilities. The lens can focus to 0.6m, which provides an image with 0.2x magnification, making it an excellent lens for shooting pictures of flowers and other closeups. While it’s not a macro lens, the close-focus abilities give the 90mm some extra versatility lacking in many portrait primes. I tested the lens on my X-T1 with firmware v. 4.0 and found the lens very capable at keeping up in continuous autofocus functions as well. I took several test runs with my daughter running full blast at close range to me, and achieved a very high success rate of in-focus shots. Most surprising to me was the fact that the lens didn’t really slow down the burst rate much when shooting in CAF, as can often happen with slower focusing lenses. 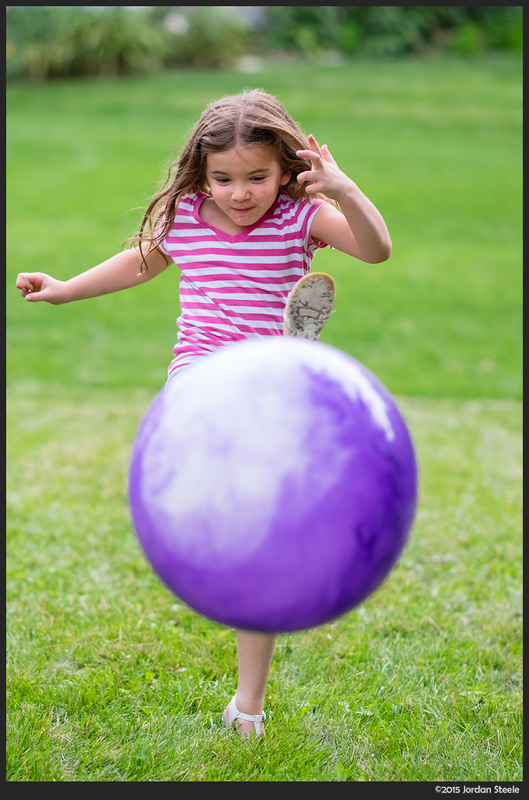 The shot below was taken after my daughter ran at full speed to kick the ball at me. Almost every shot leading up to the kick, including this one, was in focus. While the lens is weathersealed with an excellent fast and quiet focus motor, there is one Fuji letter designation I’d have liked to have seen on the lens: OIS. Because the 90mm f/2 has a fairly narrow field of view, higher shutter speeds are required to handhold the lens and maintain sharp shots. For me, I found that around 1/160s was what I felt comfortable using to get consistently sharp results. With the f/2 aperture, this generally meant shooting at ISO 3200 or higher indoors. OIS would have been great to let me shoot at around 1/60s or lower and keep the ISO down a bit. I also found that the 135mm effective field of view was long enough that my own vibration was a bit distracting in the viewfinder after using so many stabilized longer lenses over the years. Very nice review (again) Jodan! Would you recommend it to someone who already hadthe 50-140/2.8? Are you asking for permission? Because only you can judge if you need something different. That’s a bit harsh. He did not ask for permission, he asked for advice. The least you could to is comment on whether or not you would personally buy both of these lenses. It really depends on whether you use the 90mm focal length a lot. 135mm equivalent is really nice when used right, but it’s also often too long for people to get the most out of it on a regular basis. If you really like that distance/look, it may be worth picking up. The bokeh is a bit smoother, and you get the extra stop of aperture, and of course the much smaller size in comparison to the 50-140. The 90 is probably a tiny bit sharper, but I found the 50-140 to be extremely sharp right from f/2.8, so it’s not a huge difference. Maybe keep the 50-140 at 90mm for a few days and shoot only with it and see if you like that constricted view. If you do, it might be worth your money to pick one up. I’m staying with my 50-140mm f/2.8 for its amazing image stabilisation. After getting used to its tripod-like stillness I notice the movement even with my 16mm f/1.4. At 140mm I can shoot at half the shutter speed of the 16mm. I rented this lens a year ago and next to the XF16mm, it is the 2nd time I fell in love with a lens. I don’t own it though. Part of the reason is that I already own the 50-140mm and the other is that I just don’t find myself using that focal length often. If you do portraits, this would be a no-brainer. I’m still looking for reasons to buy this lens but so far can’t. Nice review, as always. But, what I really like most, compared to other review sites are your pictures! Really nice. And the kickball one …. wow! (is the lens still working ;-)? Thank you for this nice review and the selection of pictures which IMHO prove the exceptional rendering characteristic very well! The only point where I disagree with your conclusion is about the lens price – it’s a con, not a pro. The list price in Europe is 899 € which I consider at least 100 € too high with respect to the prices of brand name 1.8/85mm and 2.8/135mm lenses. Fujifilm demands a real lot of money for this bokeh gem. Do you still have the Olympus 75mm/1.8 to compare this against? It seems like the two stack up very, very closely with one another optically and in terms of DoF. The Olympus also received a $200 price cut last year, so it’s $699 price tag is perhaps more palatable than it’s $899 introduction. I do not still have the 75/1.8, but it is on that short list of lenses that I put at the very top of all I’ve used. The 90/2 is going to give you a bit shallower depth of field and more blur due to the fact you’re shooting on a larger format, and as such will be closer for the same framing. It also has a slightly larger physical aperture (45mm vs. 41mm), but the format differences will be bigger difference. I think the 75mm might be a touch sharper, though you’re splitting excellent hairs with these lenses, but the 90mm has less chromatic aberration, with no green bokeh fringing or purple fringing on high contrast subjects. Aside from the occasional fringing in the bokeh, the 90mm also has smoother, more even specular highlights with no bright ring, and the 75mm can sometimes exhibit a slight ring (though not bad by any means). The 75mm focuses a little faster (more a function of the cameras than anything else), and it’s a lot smaller to boot. I find the 135mm equivalent focal length of the 90 on Fuji to be a bit less restrictive vs. the 150mm equivalent of the 75mm on m4/3, but that’s personal preference. It doesn’t make sense to count the physical aperture difference, and sensor size difference, you’re counting the difference twice at that point. When you compare physical aperture size, you can outright ignore the sensor size. Here’s an example 25/1.4 = 17.85mm and 50/2.8 = 17.85mm, even without considering sensor size you can figure out that these lenses will provide the same DOF. Even then, the difference is very small. The DOF difference between 43rds and APS-C is roughy 2/3rd stop, and the Olympus 75mm is 1/3rd stop faster. So the DOF difference is 1/3rd stop, in other words, nearly indistinguishable. The 75mm is also slightly longer at ~150mm equiv vs ~135mm equiv, which means for a given framing, the out of focus area will be slightly magnified with the Olympus which further narrows the gap. Anyway, thanks for putting the effort into writing the review! For an occasional/amature photographer with a limited budget looking to get a portrait lens, would you recommend this or the 56mm lens? I realize the 56mm has a more practical focal distance that could potentially still be used indoors as well. -Bokeh aside, do you find auto focus much more accurate/snappy on this lens? I’d get the 56mm, simply because I think it’s more practical for most shooting situations. The 90mm is slightly better optically when looking at pure image quality, but it’s not a major difference. The bokeh on the 56mm definitely has some bright ring outlines on the specular highlights that give it some texture. Some people love that (I like it quite a bit on the 56), but others do not. I found the focus on the 90 to be faster and quieter than on the 56, but I have no problems with accuracy on either lens. I understand there’s no tripod thing on the lens, not even optional. 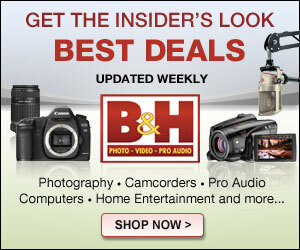 Do you think a normal (not filmsy, not superbig) tripod head will keep the camera stable, without unwanted movements? It should be fine. It’s a big-ish lens, but it’s not huge. A tripod collar would be more awkward than helping on this lens. I still have my Oly 75/1.8 with me on a E-M5, the IBIS really helps. That’s why I am still keep them in my bag. I have this lens alongside the 56 and other XF primes. My early but very clear assessment is that it is the best from the Fuji X stable so far, and the best 90 I have ever used. Pingback: Blog.pch.be » Fujifilm XF90mm F2 R LM WR : tout simplement sublime ! Great point on OIM & its size comparing to 56mm pauses me :). Thanks for great review as usual! You mention you would like to see it have OIS. 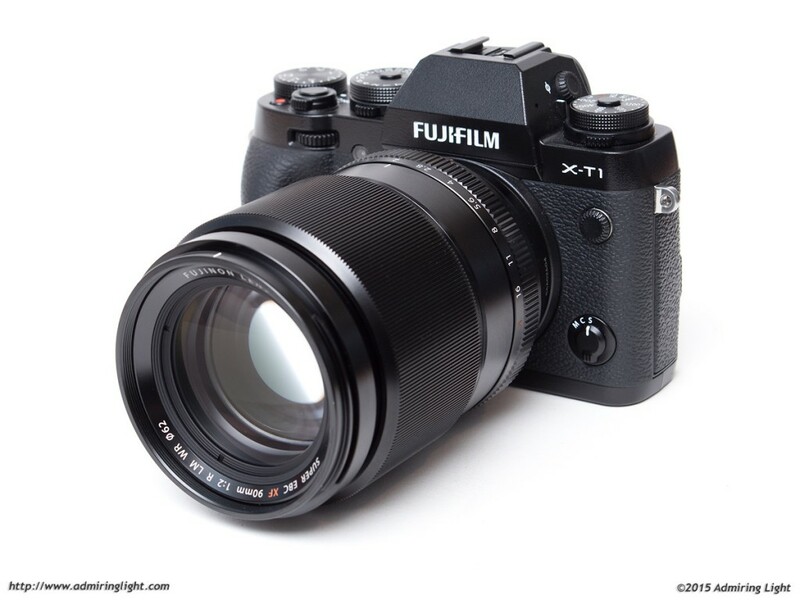 Fuji probably wanted to make the lens as sharp as possible and not have OIS take away from that, knowing that in future X-cameras, it’s not going to be a factor, because of the higher ISO capability’s. As an amateur I’m always looking for the bang for the buck options. I couldn’t help noticing that Samyang/rokinon produce 85mm f1.4, which would be a cheaper (€300) alternative for the fuji reviewed here. It of course lacks automatic focusing, but could otherwise be good option for portraits. Any possibility to compare these two against each other? In terms of image quality and focusing speed, do you think the Fuji 90mm is comparable to its canon equivalent, 135mm f/2? 1. Does the 90mm cover portrais as well as the 56mm? 2. If I have the 16mm and the 90mm, then I got covered for street, landscapes, portrais photography. I don’t need something in between (focal lenghts) like 23mm or 35mm lens, do I? Not sure if I missed it, but would love to see this lens and how it stacks up to the 135mm 1.8 Zeiss. Thanks for sharing this. I was searching for the same form some time ago and found a great service with a huge forms library. I mostly use https://goo.gl/KTiAVp to edit my PDFs. I think it also allows you to to create fillable pdfs and esign them. Pingback: ?????????????? 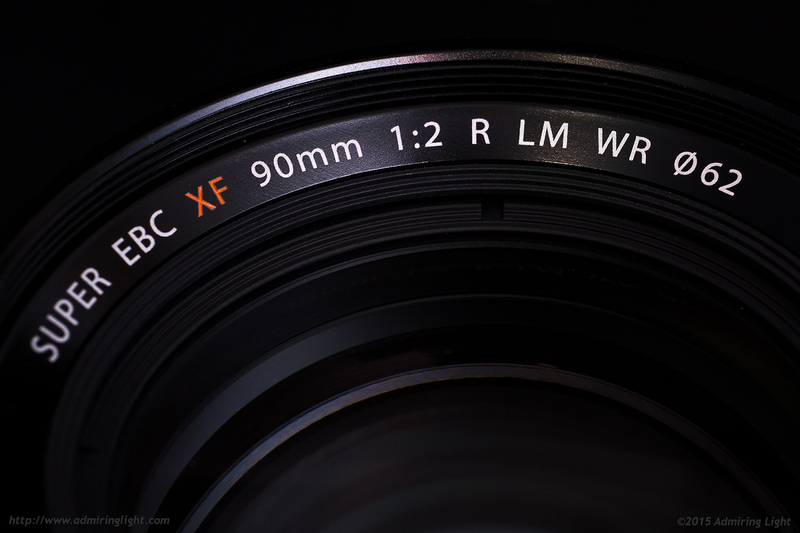 XF90mmF2 R LM WR??????? | ????????????? Pingback: ?????? XF90mmF2 R LM WR?????????????????????????? | ???????????? ?